Protect your rights and maximize your payout after a Kentucky car accident. We answer key questions and show you how to build a strong insurance claim. Advanced safety features help make today’s cars safer than ever. Unfortunately, even with all our technological progress, there are still millions of Americans injured each year in car accidents. After a car accident you’ll have to deal with car repairs, medical bills, accident reports, insurance companies, state laws, and more. Knowing what to say and do is crucial, especially if you need to file a property damage or personal injury claim. Below are 10 steps we’ve created to help guide you through the aftermath of a car accident. We’ve also provided answers to some of the most frequently asked questions that come up at an accident scene. What information will the 911 operator need? What are my legal duties after a collision? What if someone has been injured in the accident? What if I accidently ran into a parked car and no one was in it? Will law enforcement be dispatched to the accident? When do I have to report the accident to the police? How can I obtain a copy of the accident report the officer filed? How can the evidence I gather at the accident scene help? Is there additional information that will help my claim? What does the cooperation clause look like? Why do I have to notify my insurance company if I didn’t cause the crash? Are there cell phone apps to help report accidents to insurance companies? Why would I report the accident to my insurance company if no one was injured? What insurance coverage is required in Kentucky? Are there any exceptions to the no-fault system? If I carry PIP, do I still have to report the accident to my insurance company for car repairs? Is there a limit to Kentucky’s Comparative Negligence? Can you give me an example of comparative negligence? Shouldn’t I be honest and admit I caused the crash? What are the functions of police officers when they respond to a car accident? Does the investigating officer have to listen to my side of the story? What if I’m late for work or to pick my child up from school? Can I leave the scene? Do I have to answer questions from law enforcement? What if the police give me a ticket? 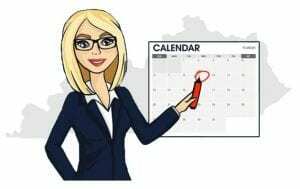 Step 8 –Hire an Attorney or Handle the Claim Yourself? When would I consider filing a lawsuit in small claims court? 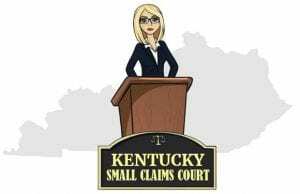 How much can I sue for in Kentucky small claims courts? Do I sue the at-fault driver or his insurance company? How can I access forms and learn more about Kentucky’s Small Claims Courts? What is the Statute of Limitations for personal injury claims in Kentucky? What is the Statute of Limitations for property damage claims? What if I can’t settle the claim within the statute of limitations period? What should I do if the statute of limitations is about to expire and I haven’t settled my claim? You’ve been in an accident. Stop immediately at the scene or as close to the scene as possible. Stay calm and remain focused. Check for injuries and then call 911. The 911 operator needs specific information to determine whether police, paramedics, or tow trucks will be needed. Avoid giving your opinion of fault. The operator doesn’t want to hear who you think caused the accident or why. Assigning fault comes later. Accident location: Be specific. Look for street signs, highway mile markers, and notable landmarks. Avoid being vague when describing your location. Giving the operator a specific location will assure that police and paramedics will arrive without delay. Description of the accident scene: Car accidents can be messy. The scene might be littered with mangled bumpers, shattered glass, and cars pointed in different directions. The other drivers may be walking around the accident trying to assess damage, oblivious to oncoming traffic. Let the 911 operator know what the accident scene looks like. This is especially important if the scene is dangerous to others. If anyone is injured: Some car accidents result only in property damage, while others result in injuries to the people involved. Injuries can range from abrasions and contusions to fractures and other serious injuries. Tell the 911 dispatcher if anyone is clearly injured, or complaining of pain or nausea. You are required to render “reasonable assistance” to any person injured in the accident. This includes driving them or making arrangements for them to be taken to a hospital if they clearly need medical treatment or if they ask you to. If you accidentally hit a parked car, Kentucky law requires you to stop immediately at the accident scene. Once stopped, you must make a reasonable attempt to locate the owner of the vehicle and give them your name and address, your registration number, and the name of your car insurance company. If after making a reasonable effort, you can’t find the owner of the vehicle, you must leave a note in a conspicuous place on the car. The note needs to include your name and address along with an explanation of what happened. 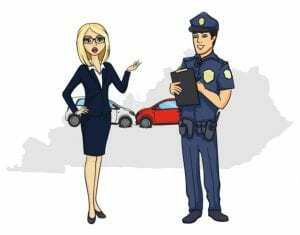 Each law enforcement agency has its own policies governing when investigating officers and paramedics will be dispatched to a Kentucky car accident scene. Most will not dispatch emergency personnel unless there are obvious injuries or the accident presents a danger to others. Some injuries are obvious, like fractures, gashes, bruising, and the like. However, sometimes the symptoms of an injury won’t appear for hours or even days after an accident. If the paramedics arrive, tell them how you feel and what symptoms you are experiencing. If they want to transport you to the local hospital, let them. If the paramedics don’t think your injuries are serious enough to require transporting you to the hospital, you should make an appointment with your primary care doctor as soon as possible after the accident. This is especially important when filing a personal injury claim against the other driver. The longer you delay seeking medical attention, the greater the chance the insurance company will say your injuries were a result of an entirely separate and unrelated event. If the accident resulted in injury, death, or property damage worth $500 or more, you must report the accident to the Department of Kentucky State Police within 10 days. The Civilian Collision Report form can be found on the Kentucky State Police website. If law enforcement responds to the scene, you are exempt from having to report the accident. If law enforcement responds to the accident, how can I obtain a copy of the accident report the officer filed? If local law enforcement responded to the accident, they will create an accident report, referred to as a Kentucky Uniform Police Traffic Collision Report. 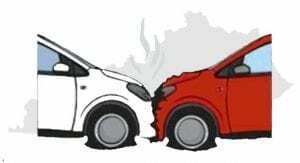 In the collision report, the names of all parties involved in the accident will be listed along with the time and date of the accident, the location, and any property damage. 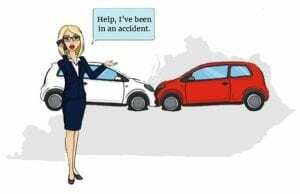 Kentucky Collision Reports also list the apparent contributing factors such as weather, lighting conditions, driver inattention, and any traffic citations that were issued. After completing the report, it will be made available in 2 – 3 days online or via U.S. Mail. The minutes immediately following an accident can be crucial to a property damage and personal injury claim. This window of time presents a unique opportunity to access real-time evidence you’ll need to build a successful claim. Accident scenes are fluid. Before long, cars will be driven or towed away, law enforcement will return to the station, and the other drivers, passengers, and witnesses will leave. Unfortunately, crucial evidence may leave along with them. To support your claim for damages, you will need proof of the other driver’s liability. The evidence you gather has to prove that the other driver’s negligence was the sole cause of your property damage or injury. Note: The VIN number can be found on the car’s dashboard in the left corner where it meets the windshield. It can also be found on the driver’s insurance card or inside the driver’s side door jam. Note: While witnesses aren’t legally required to remain at the scene, convincing them to do so will give you time to speak with them to determine if what they saw can help your claim. Yes. Use your digital camera, cell phone, iPad or other electronic device to take multiple photos and videos of the accident scene. 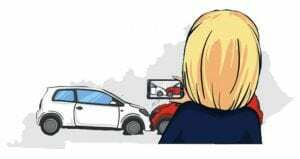 Photographs and videos can identify the position of the cars immediately after the collision, weather conditions, potholes, road obstructions, traffic and street signs, and more. They can also capture the demeanor of others at the time of the accident. Sound is important because it can capture such factors as admissions of fault, intoxication, statements about insurance, and other inculpating statements. Another reason to take photographs and video is that doing so makes it difficult for people to change their stories later. Witnesses are under no legal obligation to speak with you or provide you with a written statement. However, they can be very helpful in constructing your claim. If you can find a witness who agrees to speak with you, get some paper and ask them to write down what they saw and heard. Be sure the witnesses sign and date each page of their statement and get their contact information in case you need to reach them later. Your car insurance policy is a legal binding contract between you (the insured) and your insurance company (the insurer). The policy contractually obligates your insurance company to provide coverage for you up to the limits of your policy, including providing legal representation to you at no cost if required. In return, you are obligated to cooperate with your insurance company in the investigation of the accident. This includes promptly reporting the incident to them (even if you believe you are not at fault), answering their questions, cooperating with their attorneys, and even testifying in depositions or at trial if necessary. Your contractual duties can be found in the “Notice of Occurrence” and “Cooperation Clause” of your auto policy. While each insurance company’s policies are different in form and substance, they all basically contain the same information. Under certain circumstances, if you fail to comply with these terms of your insurance policy, the company may decide not to renew your policy at its expiration date, raise your premiums, or in some cases, even cancel your policy. While you may think you had no fault in the crash, the other driver may have a different opinion. Promptly contacting your insurance company gives them ample opportunity to get out in front of any claim, protecting you as their insured. Yes. There are a substantial number of free mobile apps available to help you report a crash to your insurance company. 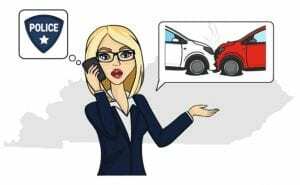 If the accident was only a fender-bender, with nobody injured and only slight damage to the cars, you may be tempted not to report the accident to your insurance company. You may think doing so will only increase your premiums. While the accident may appear to be minor, not reporting it to your insurance company is a serious mistake. Here’s why…. Delayed Symptoms: The other driver or passengers may believe they were not injured, but because the onset of symptoms for some injuries can take hours or even days to appear, the injuries you thought were non-existent, suddenly become very real. No Insurance: The other driver may not have property damage or personal liability coverage. If so, the last thing they want is for you to know or for the police to find out. That driver knows he or she will be ticketed, or worse, arrested. Fraud: While at the scene, the driver and their passengers may say they weren’t injured, but later decide to try and “cash-in” on the accident by filing fraudulent claims of whiplash or other injuries. The State of Kentucky relies on a no-fault car insurance system. Under the no-fault system, each driver involved in a crash relies on his or her own car insurance to pay medical bills, out-of-pocket expenses, and lost wages resulting from any crash. No-fault insurance does not pay for pain and suffering. Because the state follows the no-fault insurance doctrine, it requires all drivers to carry Personal Injury Protection (PIP) coverage. Kentucky requires basic PIP coverage on all cars and trucks, but motorcycles are exempt. This basic PIP coverage provides up to $10,000 per person per accident. The no-fault system requires drivers turn to their own insurance company for compensation, not to the at-fault driver’s insurance company. This includes reimbursement for all medical, chiropractic and dental bills, out-of-pocket expenses, costs of travel to and from treatment, and for lost wages. Pain and suffering compensation is not paid under Kentucky’s no-fault system. 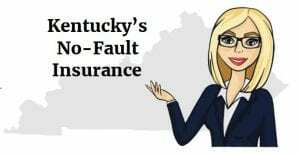 Moreover, Kentucky drivers have the right to forego the no-fault requirements, but must do so in writing on a form provided by the Kentucky Department of Insurance. If you reject PIP, you are not entitled to receive basic PIP benefits. If I carry PIP do I still have to report the accident to my insurance company for car repairs? No. PIP does not cover property damage. 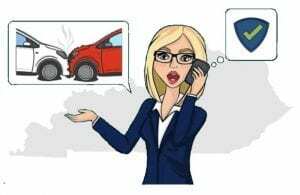 Therefore, if the other driver was at fault, you have the right to contact the driver or his insurance company and demand compensation for the repairs to your car. 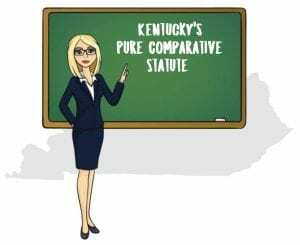 The State of Kentucky has adopted the Pure Comparative Fault System. Under the Kentucky fault system, each driver is held responsible (liable) for damages sustained in the accident in proportion to that driver’s percentage of fault in causing the accident. No. Unlike many other states that have a limit on the amount of negligence a victim can contribute to a car accident, in Kentucky even if a victim is 99% at fault, they can still recover compensation from the other driver. Claudia was driving home from work when suddenly Joey crashed into the rear of her car. Claudia sustained serious injuries resulting in medical bills well in excess of Kentucky’s $1,000 threshold. This thereby exempted her from having to file her injury claim with her own insurance company. At the scene of the accident, the responding officer cited Joey for “Following too Closely” in violation of Kentucky Revised Statute § 189.340. However, the officer also cited Claudia for “Texting While Driving” in violation of Kentucky Revised Statute § 189.292. Joey’s insurance company refused to settle for that amount and the case went to trial. After hearing from witnesses, the jury determined both drivers contributed to the accident. However, they decided Joey’s comparative negligence was 70% and Claudia’s was 30%. As a result, the jury awarded Claudia $140,000, representing her damages minus her 30% of the blame. No. The accident scene is not the place to admit fault. There are just too many variables in a car accident. While you may believe you caused the crash, you have no way of knowing what the other driver was doing immediately before the crash. He may have been distracted while texting, intoxicated, speeding or any other number of things that could have contributed to the accident. If so, your fault for the accident may be much less than you realize. Report the accident to your insurance company and let them investigate the circumstances. After all, that’s why your pay premiums. When law enforcement officers respond to a Kentucky car accident, they have a very important job to do. Regardless of whether it is local police, sheriff’s deputies, or Kentucky Highway Patrol, each of these divisions is highly trained in accident investigation. When law enforcement officers arrive at an accident, their primary duty is to protect those involved and to make arrangements for the care of anyone injured. To do this, officers will usually secure the scene by setting out flares, pylons, and police tape. They will also do a quick assessment of each person involved to see if anyone requires medical attention. Once the accident scene is secured and the injured are cared for, the investigating officers create an accident crash report. In the report will be the names and addresses of drivers, passengers, witnesses, pedestrians and cyclists. The investigating officer will make notations about weather conditions, road obstructions, car positions, and list any traffic citations issued. The report will also likely contain a diagram of the accident scene. The crash report can be an important tool in your property damage or personal injury claim. Most accident reports are available from local law enforcement within 2 – 3 days after the accident. Not necessarily. You have a right to speak with the investigating officer. However, you must also follow the officer’s direction at all times. When a police officer gives you a lawful directive, you must obey it. Avoid getting in the way or otherwise keeping the officer from doing his or her job. Be patient and know that the officer will eventually want to hear your point of view. No. If you’ve been involved in a Kentucky car accident, you can’t leave until the officer permits you to. You may not like it, but you have no choice. Ask the officer if you can use your phone to call someone to pick your children up from school, or to call your employer to say you will be late. There are some questions you must answer. For example, if the officer asks you for proof of car insurance, your name and address, or asks for your driver’s license, you must produce those items and answer the questions truthfully. However, if you’re being questioned about a crime such as driving under the influence, possession of drugs, or for any other crime which might result in criminal charges being brought against you, you have the right to refuse to answer any of those questions. If the investigating officer concludes you violated a traffic law, you may be issued a ticket. While you can try to dissuade the officer from giving you the ticket, once it’s issued you must accept and sign it. Remember, signing and receiving a traffic ticket is not an admission of guilt. Rather, it only constitutes an agreement that you will appear in court at a later time to deal with the citation. At that time, you may enter a plea of not guilty and contest the ticket by asking for a trial. Depending on your driving record, you may also ask the prosecutor or the judge to give you a “suspended” or “deferred” sentence. If granted, you may have to take a defensive driving course or pay a fine. Once completed however, the ticket may be dismissed and not appear on your driving record. There are some personal injury claims that can be handled without legal representation. However, there are others that will always require the assistance of a trained professional. Soft tissue injuries include strains and sprains to tendons, muscles, ligaments, minor bruising, abrasions, minor burns, whiplash and similarly mild injuries. Soft tissue injuries normally don’t require substantial medical treatment. Because of the straightforward nature of these injuries, these cases rarely result in lawsuits. As a result, legal representation is not always necessary. Because soft tissue claims normally don’t result in substantial insurance settlements, having legal representation may result in a net settlement far less than what you could have been awarded on your own. Unlike soft tissue injury claims, more serious “hard injuries” usually require legal representation. These types of injuries include things like head trauma, compound fractures, loss of body parts, disk herniations, deep gashes requiring stitches, 3rd degree burns, and disfigurement. There’s simply too much to lose in a serious injury claim. You can only negotiate so far with an insurance company claim adjuster. While they may appear to be empathetic, in reality they will be doing everything possible to settle your claim for as little as possible. Once the adjuster says that’s all they can offer, there’s nothing more you can do. Having an experienced personal injury attorney in your corner in a serious injury claim will almost always result in a higher net settlement to you, and that’s even after attorney’s fees are deducted. Most personal injury do not charge legal fees for an initial office consultation. During your first visit, they will review the underlying facts of the accident, read the crash report, and review medical records and witnesses statements. If the attorney concludes your claim is viable, they may also be able to tell you the likelihood of success, the approximate time it will take to resolve the claim, the possibility of a lawsuit having to be filed, and an approximate amount the claim may be worth. The attorney is responsible for paying all costs out of his or her own pocket in advance to prepare your claim, including private investigator fees, medical experts, court fees, and more. You will only be responsible for paying the attorney if they succeed in resolving your case. Small Claims Courts exist to provide a relatively informal forum where people can resolve differences. The rules of evidence are relaxed, and attorneys are seldom around. 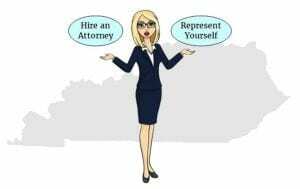 Small claims courts in Kentucky are a division of Kentucky’s District Courts. These courts were established so parties can present their own cases and have them resolved without the assistance of an attorney. The Small Claims Division of District Court in each Kentucky county has jurisdiction to hear cases up to $2,500. The at-fault driver caused the accident, not his insurance company. In a car accident, the insurance company has no legal liability to you. They are only obligated to provide coverage to their insured, including paying legitimate claims and providing legal representation where required. How can I access forms and learn more about the polices of Kentucky’s Small Claims Courts? To access forms and learn more about filing a case in Small Claims Court, visit the Kentucky Court of Justice website. When it comes to car accident claims, each state has a specific period of time in which a victim has to either settle their claim, or file a lawsuit. That period of time is called the Statute of Limitations. At one year, the State of Kentucky has one of the shortest statute of limitations periods for personal injury claims. While the statute of limitations for your personal injury claim in Kentucky is one year, the limitation period for property damage claims is two years. If you’re unable to settle your property damage or personal injury claim within Kentucky’s statute of limitations, you will lose your legal right to pursue the at-fault driver for compensation for your medical bills and other related costs. You should never allow the statute of limitations period to even come close to its expiration date. Doing so is a recipe for disaster. If it passes, that will be the end of your claim and any chance of being compensated for your damages. If the statutory period is imminent, file a lawsuit in small claims court or contact a personal injury attorney. Once a lawsuit is filed, the statute of limitations is “tolled,” meaning it no longer applies, even if it takes another year or longer to finalize your claim.